alien visitation theme! … Il est magnifique! 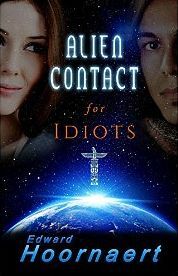 When American aborigines from the future move their entire island nation to our Earth, Ell Harmon makes the first alien contact. The take-charge Seattle biologist has yearned to find intelligent aliens, and her dream comes true when she meets Prince Tro Eaglesbrood. Marianne Harmon dreams of being a warrior rather than the pampered kid sister of the queen, but when rebels strike, she’s thrust into a more dangerous adventure than she’d bargained for. Can she trust the man in a Royal Guardian’s uniform who’s trying to save her…or maybe seduce her…or possibly even kidnap her?